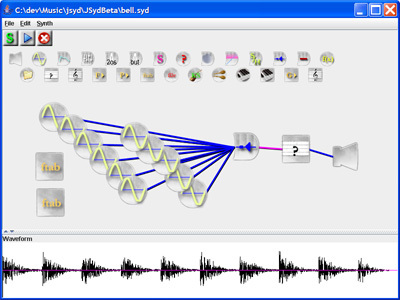 Syd (formerly "SoftSynth") is a cross-platform instrument editor and software synthesizer by Jim Bumgardner. It has a graphical "patch cord" interface, and an elegant method for producing polyphony, compared to other patch-based music languages. It is particularly suitable for teaching computer music. The Java version provides an elegant patching interface, and the C++ version can be used to render patches on the command line. NOTE: If you are interested in contributing to Syd on Github, let me know. Download the Macintosh source code for Syd 1.0.6. Download the Windows source code for Syd 1.0.7. Note: The Windows source archive requires Aladdin Expander to unpack. Read the (Mac) documentation Note: The windows version has built-in help via the F1 key. Syd screen shot (Macintosh version) I wrote Syd so I could reproduce some of the sounds produced by the Buchla 200 analog synthesizer I used to play with at CalArts in the early 80's. It has since evolved into an interesting computer-music tool in its own right. Send comments, bug reports and requests to Jim Bumgardner. 9/20/11 I've created a GIT repository for both JSyd and CSyd. 5/8/09 I updated JSyd and CSyd today (versions 1.0.3 and 1.5.1, respectively). A bug was fixed in JSyd which was causing bursts of noise when saving to a WAV file. CSyd has been updated to support stereo patches. 7/27/06 I am currently working on a rewrite of Syd for Java. This version has a completely new interface, and works on modern macintoshes (unlike the original mac version of Syd). 9/12/03 Syd users will probably enjoy my other work. You can find it at KRAZYDAD (my new website). 11/10/98 A SYD mailing list, and a patch download area have been added. 10/20/98 The first Windows version of Syd is now available. It has built-in documentation via the F1 key, and outputs both WAV and AIFF files. 10/3/98 I've added online documentation for the Macintosh version of Syd here. 10/1/98 The Macintosh version of Syd was favorably reviewed in the November issue of Keyboard magazine.